Shire Gin is a true artisan gin handcrafted in small batches by the Lancastrian gin loving Glynn family. 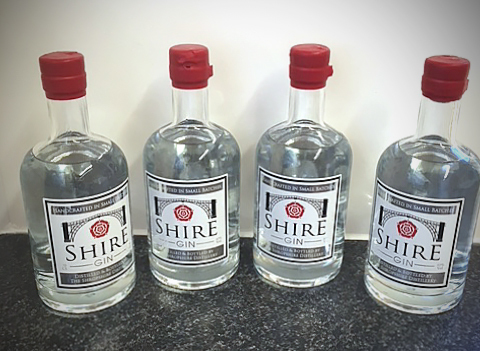 Each bottle is individually signed and bottle numbered by hand at their distillery in Shropshire. Every batch is distilled using traditional methods in a copper pot still at the distillery using 100% wheat grain spirit and quality sourced botanicals to create a smooth London Dry Gin. The design required a clean opaque white background to contrast the silver surround and text. In additional to this the red rose needed to pop from the design and really stand out on shelf. Reel Labels worked on a number of different options and also made sure that these worked across both size bottles that were being launched in the range. Particular attention was taken with the rose to make sure all ideas were considered for shape, size and also if a metallic or standard red was going to work best. After a few options were test printed on the digital inkjet press these were supplied in good time for customer approval and then mass production ahead of the product launch.